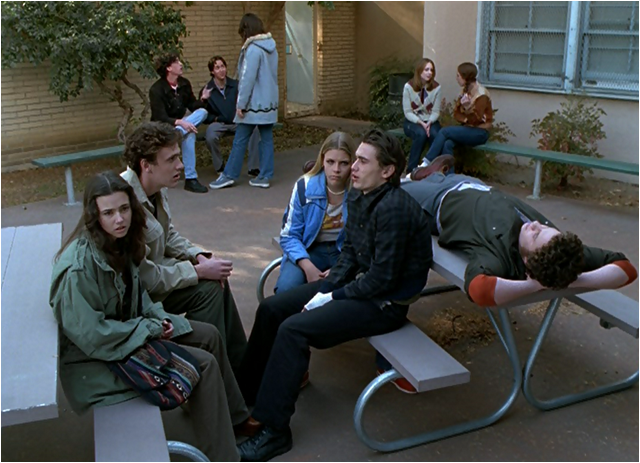 Emma: So, once again it’s an episode of Freaks and Geeks split into two different stories that cover important aspects of the teenage experience: fake ID and first love. 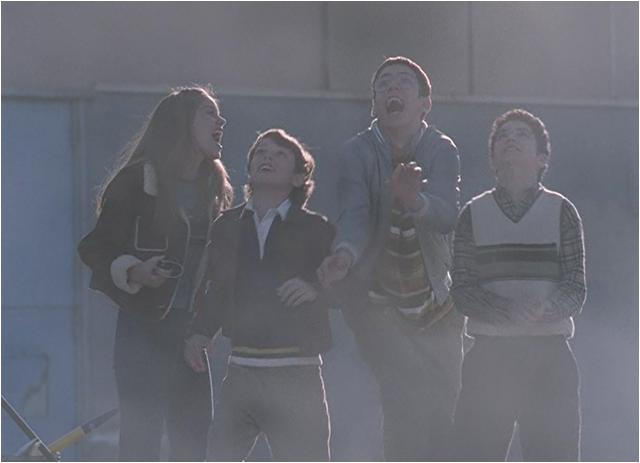 I’m going to start with the Freaks story and their quest to get into a bar to see a cool band. At the start of the episode they are all in a meeting with guidance counselor Mr. Rosso. Mr. Rosso is displaying his usual attempts of connecting with the kids by being on their level and explaining that he understands how they feel. This includes an acoustic guitar rendition of Alice Cooper’s “I’m Eighteen” and they fake-indulge him by singing along. Lindsay looks mortified, but Nick joins in air-drumming and he’s the only one that doesn’t think this is the lamest thing he has ever seen. This interaction comes back to bite them at the end of the episode as it turns out that it is Mr. Rosso’s band is the one they’ve been desperately trying to see and he humiliates them in front of the entire bar. He does this not in a mean way (even if it is mortifying) but with his rather cheerful demeanor—and this probably makes it even worse. 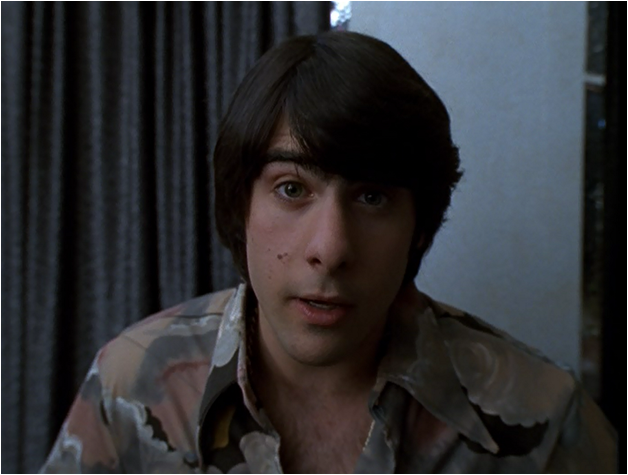 The attempts to get fake IDs include going to see Jason Schwartzman, who works in a rather flamboyant clothes store. He is terrible at getting fake IDs that look like them, even though he only has to remember brown eyes, brown hair. (Ken sticks with his and successfully pretends that he is called Jesus.) Their second attempt involves Millie’s cousin who happens to be the black sheep of the family. 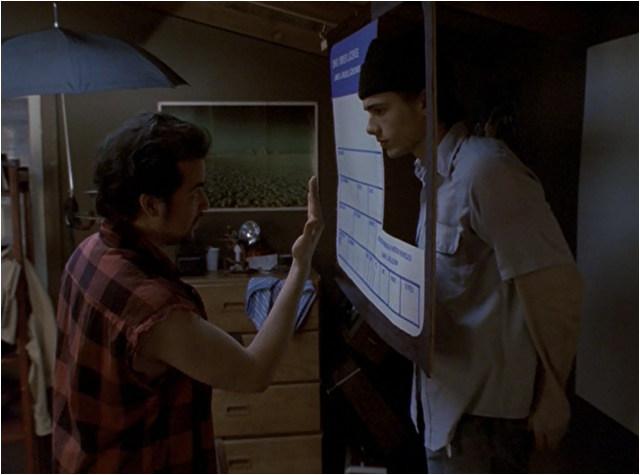 Toby is played by the wonderful Kevin Corrigan, who has a habit of showing up in Apatow movies as a menacing character (and also played Professor Professorson on Community). His fake ID setup is brilliant, but he’s also super creepy and comes onto Lindsay. When she rejects him and Nick says that he is her boyfriend then Toby ups the price of the ID, but Lindsay uses her college money to pay for them all anyway. Ken is a lot more receptive to Lindsay after this offer, though he does snark his way through the rest of the episode much to my delight. Getting a fake ID is a storyline that doesn’t just occur on high school shows, but also on college ones, and because the drinking age is 18 here this always feels like an alien concept that you can’t drink legally at the start of college. Fake IDs weren’t as prevalent when I was below the legal drinking age, we did have tricks to help with getting served though. For some reason I thought that my glasses made me look older so I wore them when getting into bars (this was back when I didn’t need to wear them all the time). I also thought that smoking made me look older and this is when you could still smoke in bars. I’m not sure if either of these things actually made me look older, but maybe it gave me the extra confidence boost. I was one of the first to turn 18 in my year at school so I never really had that much trouble. The funniest ID encounter I had was with my friend who was only 17 at the time and had no ID, we got ID’d and walked around the corner, switched coats and she took down her hair. We went back 5 minutes later and they let us in with no problems! I actually get ID’d so much more now that I’m 30 than I ever did when I was 17, this is mostly in supermarkets where they are pretty strict now. Have you got any good fake ID stories? This was also a story of letting go, particularly with Harold Weir who wants to spend time with his children playing Pit. I’m glad they have finally taken the time to define Harold beyond his hilarious tragic tales and grumpy exterior. Yes he is still grumpy in this episode but he also shows passion for Pit and his family. Lindsay’s mom Jean has already had this moment earlier in the season when Lindsay didn’t want to join in with handing out candy on Halloween and she’s a lot more relaxed about letting the kids spend time away from the family. She’s embracing the “if you love them let them go philosophy” and she also has a bit of the Patty Chase about her this week as she propositions her husband. It’s hilarious because Harold doesn’t really jump at his wife’s offer. Thankfully F&G doesn’t go down the MSCL path of showing the parental passion. What did you think of the Freaks mission to get into the bar? Julie: Jason Schwartzman looking at them all so carefully (brown hair, brown eyes) and then coming back with horrible fake IDs might be one of my favorite things to appear on television ever. It was just so perfectly executed. I also loved Ken embracing his Jesus-ness. Own it, Ken! Sadly, I never used a fake ID. I didn’t drink much in high school. If I ever did, it was just at someone’s house (and I let someone else take the risk of buying the booze). Freshman year of college, I went to visit some friends at University of Illinois, but down in Champaign (at least back in late ’90s) they let anyone over 19 into the bars. Once inside, all you had to do was find a guy who was over 21 and willing to buy drinks for you all night. Not too hard, generally. I was already 19, so no need for the ID. I went to college in Indianapolis, and I remember them carding hard down in Indiana, like you needed two forms of ID to get into a bar? I don’t know. Maybe I’m making that up. Anyway, I went to a lot of parties, and was never wanting for alcohol, so I didn’t really feel the need to risk sullying my Permanent Record by attempting to get into a bar. By the way, our drinking age here should totally be 18. It makes so much more sense than 21. Anyway, the show. I was a little mad at Lindsay for giving them all the money for the IDs. I mean, I get why she did it. I understand that she’s still trying to fit in, but I wish she’d stop trying so hard. They like you, Lindsay! Own it. She was also a little too pumped about going to the bar and not quite nervous enough about it. She used to be a massive rule follower. I know her kind. We’d have an upset stomach for days before attempting this kind of deception. I am very, very thankful that we didn’t get a “the Weirs go to the bedroom” moment. I liked that Mr. Weir seemed to think that he was in for some living room(?) nookie. Maybe he was hoping to take things outside or in the front hallway. I don’t know what turns him on. I don’t know his life. I do, however, know what turns on the Geeks. (Like that segue?) They just want a hot, new girl who pays attention to them. Is that too much to ask? I loved that the writers made everyone excited about the new girl in school. I don’t remember anyone ever ostracizing someone because they were new. People were always super excited about a new person. Everyone always wanted to claim the new person for their group, we were all so sick of each other. Were you ever the new kid in school? 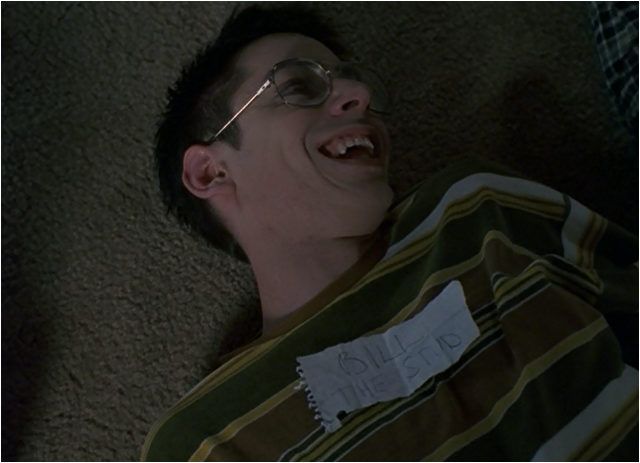 What did you think about the Geeks? Do you have more to add about the freaks? Emma: I think that Lindsay is trying too hard with paying for the fake IDs but it’s also a way to push the idea of college further away. Mr. Rosso mentions that she needs to start thinking about college and the money is another reminder of this impending decision. By spending the money she doesn’t have to consider the college options that are expected from her. Now to the Geeks and this storyline was delightful. I was never the new kid, but our year size went from 60 to 150 for the last two years of school (for A Levels) so there was a huge influx of new kids. It was weird to get such a huge amount of people when you were so used to seeing the same faces for 5 years. One of my favorite things about the introduction of Maureen is that it’s by sheer coincidence that they get to hang out with her, all because she sat at their lunch table. Of course they don’t know how to interact with her at first, this is a rare occurrence for them. We’ve seen Sam talk to Cindy, but other than that we’ve not really seen them talking to any girls in their grade. It’s all really innocent still, they ask her to launch rockets (there were so many ‘that’s what she said moments, but they’re not at that smutty level yet) and they go out for all you can eat. They act like themselves and she still wants to be their friend and I’m glad that the show went for this option rather than having them being awkward and ruining it all. They’re still awkward it’s just very endearing. The use of Billy Joel throughout the Maureen scenes is a nice touch too and really emphasises how perfect it has been for them (I’ve been listening to a lot of Billy Joel recently). It comes to an end and even though Maureen doesn’t think anything has changed the boys know the school hierarchy doesn’t allow girls like Maureen to hang out with guys like them. It’s why they try so hard to stop her from talking to the cheerleaders. Do you think they can break these group rules and remain friends? I like that they realize that a girlfriend can also be your best friend but the deciding who ‘got her’ made me a little uneasy, even if they don’t have bad intentions. I think it’s the whole objectifying (particularly from Neal) that makes me uncomfortable. Though Bill referring to himself as a stud is hilarious. What did you think of this part? Julie: This is kind of random, but I remember watching this episode the first time around and hearing Maureen’s name differently every time someone said it. It took me forever to realize what they were saying. I heard Rain and Lorraine and, I don’t know, probably Janos Slynt, as well. The same thing happened this time around. Did you have this problem, or was it just me and my old ears? I absolutely loved all the Billy Joel songs in this episode. I haven’t been listening to Billy Joel lately, but now I think I will be.I think the boys could’ve remained friends with Maureen. She seems like a fun, decent girl who doesn’t get all hung up on social status. Maybe I’m giving her more credit than I should, but I’m pretty sure she would’ve been able to tell on sight that these boys are not the most popular kids in school. They’re not, like, stealth geeks or anything. But she hung out with them anyway. And when the cheerleader invited her to a party, she assumed the boys were going too. Maybe she comes from a place that is less cliquish than Sam’s school. I don’t know. But I think she honestly enjoyed their company and probably could find a way to straddle the line between popular kid and geek. Maybe she can even get the geeks invited to some cool parties. However I don’t know if I want to see Neal try to fit in with the popular kids. Bill could totally handle it, though. The whole “calling dibs” on Maureen thing seemed completely natural and honest. Yes, it’s weird. Yes, it’s a little demeaning, but I remember settling things that way. I remember doing this a lot, actually, especially in grade school. Most of the time (hell, all of the time) the exercise was moot, because the objects of my friends’ and my affections had no idea we existed, let alone wished to become their girlfriends. It’s kind of the same thing for Bill, Sam, and Neal, but it’s a preemptive way to save their friendship JUST IN CASE. And Bill should keep on referring to himself as a stud. Own it. Emma: I am with you on the name front, I heard about 3 different names and just referred to her as Vicki in my notes (that’s who she played in The Vampire Diaries). One moment that I did enjoy and this is probably because I find Cindy to be so bland was when they were walking down the corridor and Cindy said hi and Sam barely paid her any attention. Maureen is the kind of girl that I would be happy for Sam to be crushing on and so I hope we get to see more of her (I can’t remember if we do or not). I also get what you’re saying about the “calling dibs” aspect and if they were older it probably would have bothered me even more. I’m glad that they can settle things to stop future fights. It’s hilarious that Bill is the most trusted when it comes to picking out of the hat, but he’s the one with the trick to find his bit of paper (pretty smart too). I don’t think I have anything else to add but once again it was a very fun episode. Julie: I loved Sam’s reaction to Cindy in the hallway. Take that Bland Cindy! There’s a new girl in town. I also have no idea if Maureen is a recurring character. She obviously made a huge impact on me during the first time I watched the show. So we’ll have some surprises coming to us in future episodes, then, I suppose. Nobody spoil this for us! Love the U of I shoutout. I’m writing this from Champaign. And, yep, they still let 19-yr-olds into bars (also in Carbondale, where I went to college). 13-year-old boys objectifying women? Say it ain’t so! !